A journey through the lush Cape Winelands of the Western Cape will soon reveal why South Africa has gained an international reputation for the production of award-winning wines.There are a number of wine growing areas in South Africa, the bulk of our wine comes from the area we classically call 'the Winelands' that includes Stellenbosch, Paarl and Franschhoek. Towns such as Stellenbosch, Paarl, Wellington and Franschhoek are framed by mountains and lush vineyards and are home to historic buildings and museums that showcase the natural beauty, world renowned wines and accessibility to Cape Town make the winelands an ideal holiday destination.Visitors may have a hard time choosing which of the many superb wine routes to explore.The Cape Winelands is a scenically enchanting region.Dramatic mountains and fertile valleys are planted with vines stretching across rolling fields. Here farmers enjoy perfect conditions and produce some of the best wines in the world. It is the Mediterranean climate and winter rainfall of the south-western Cape that produces some of the best wines in the country. The production of wine has shaped the development of this area for over 300 years, and it has been proposed for consideration as a World Heritage Cultural Landscape.The winelands are a wonderful combination of small historic towns, beautiful scenery and wine estates producing delicious wines and brandies.The Cape Winelands features health spas, golf courses, restaurants, nature reserves, museums, galleries, open-air theaters, art & craft shops and, row upon row of vineyards changing colors with the seasons.Visitors could enjoy hiking, game viewing, bird watching, canoeing, 4x4 trails, horseback safaris, mountain biking, abseiling, kloofing, rock pool swimming and more. Stellenbosch is the de facto capital of the Winelands. It is very attractive and full of old thatched and whitewashed Cape Dutch buildings and historic national monuments. The wine estates of Stellenbosch are most impressive, with grand manor houses and beautifully laid out grounds. Here you'll find beautiful wine farms, amazing restaurants, charming guest houses and unforgettable wines. The Stellenbosch wine route is the oldest in the country and represents over 300 wineries. Because of this it is divided into a number of sub-routes to make it easier to travel, namely: Bottelary Hills, Devon Valley Vintners, Helderberg and Simonsberg-Stellenbosch.Bottelary Hills lies on the slopes of the Bottelary mountain range and produces red wines.Devon Valley Vintners lies to the west of Stellenbosch focus on red wine but also produced premium white and sparkling wines. Franschhoek is the heart of one of the oldest and most beautiful wine routes in the Cape. The valley produces all the classic styles and noble cultivars - from whites such as Sauvignon Blanc, Semillon through to the reds of Cabernet Sauvignon, Shiraz, Merlot. Over 30 wine cellars produce some of the country’s top wines. Paarl is renowned for its very beautiful countryside, excellent wines and some incredible architecture. 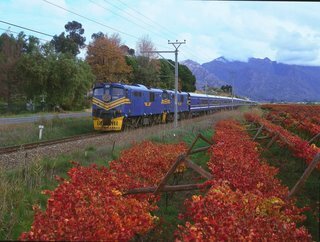 Paarl Wine Route is also known as the ‘Red Route’ because a large variety of grapes are grown in Paarl, including Cabernet Sauvignon, Pinotage, Shiraz, Chardonnay etc.